For other uses of Augustus, see Augustus (disambiguation). Augustus (plural augusti), /ɔːˈɡʌstəs/; Classical Latin: [awˈɡʊstʊs], Latin for "majestic," "the increaser," or "venerable"), was an ancient Roman title given as both name and title to Gaius Octavius (often referred to simply as Augustus), Rome's first Emperor. On his death, it became an official title of his successor, and was so used by Roman emperors thereafter. The feminine form Augusta was used for Roman empresses and other females of the Imperial family. The masculine and feminine forms originated in the time of the Roman Republic, in connection with things considered divine or sacred in traditional Roman religion. Their use as titles for major and minor Roman deities of the Empire associated the Imperial system and Imperial family with traditional Roman virtues and the divine will, and may be considered a feature of the Roman Imperial cult. In Rome's Greek-speaking provinces, "Augustus" was translated as sebastos (σεβαστός, "venerable"), or hellenised as augoustos (αὔγουστος). After the fall of the Roman Empire, Augustus was sometimes used as a name for men of aristocratic birth, especially in the lands of the Holy Roman Empire. It remains a given name for males. Some thirty years before its first association with Caesar's heir, Augustus was an obscure honorific with religious associations. One early context (58 BC), associates it with provincial Lares (Roman household gods). In poetry and prose it was the "elevation" or "augmentation" of what is already sacred or religious. Some Roman sources connected it to augury, and Rome was said to have been founded with the "august augury" of Romulus. The first true Roman Emperor known as "augustus" (and first counted as a Roman Emperor) was Gaius Julius Caesar Octavianus (Octavian). He was the adopted son and heir of Julius Caesar, who had been murdered for his seeming aspiration to divine monarchy, then subsequently and officially deified. Octavian studiously avoided any association with Caesar's claims, other than acknowledging his position and duties as Divi filius, "son of the deified one". Nevertheless, his position was unique, and extraordinary. He had ended Rome's prolonged and bloody civil war with his victory at Actium, and established a lasting peace; he was self-evidently favoured by the gods. As princeps senatus ("first man or head of the senate") he presided at senatorial meetings. He was pontifex maximus, chief priest of Roman state religion. He held consular imperium, with authority equal to the official chief executive; he was supreme commander of all Roman legions); and held tribunicia potestas ("tribunician power"). As a tribune, his person was inviolable (sacrosanctitas) and he had to right to veto any act or proposal by any magistrate within Rome. He was officially renamed Augustus by the Roman Senate on January 16, 27 BC – or perhaps the Senate ratified his own careful choice; "Romulus" had been considered, and rejected. So his official renaming in a form vaguely associated with a traditionally Republican religiosity, but unprecedented as a cognomen, may have served to show that he owed his position to the approval of Rome and its gods, and possibly his own unique, elevated, "godlike" nature and talents. His full and official title was Imperator Caesar Divi Filius Augustus. Augustus' religious reforms extended or affirmed augusti as a near ubiquitous title or honour for various minor local deities, including the Lares Augusti of local communities, and obscure provincial deities such as the North African Marazgu Augustus. This extension of an Imperial honorific to major and minor deities of Rome and her provinces is considered a ground-level feature of Imperial cult. It continued until the official replacement of Rome's traditional religions by Christianity. The title or name of Augustus was adopted by his successors, who held the name during their own lifetimes by virtue of their status, offices and powers. This included the Christian emperors. 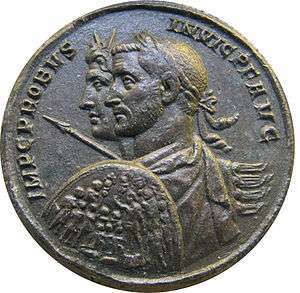 Most emperors also used imperator but others could and did bear the same title and functions. "Caesar" was used as a title, but was also the name of a clan within the Julian line. Augusta was the female equivalent of Augustus, and had similar origins as an obscure descriptor with vaguely religious overtones. It was bestowed on some women of the Imperial dynasties, as an indicator of worldly power and influence, and a status near to divinity. There was no qualification with higher prestige. The title or honorific was shared by state goddesses associated with the Imperial regime's generosity and provision, such as Ceres, Bona Dea, Juno, Minerva, and Ops, and by local or minor goddesses around the empire. Other personifications perceived as essentially female and given the title Augusta include Pax (peace) and Victoria (victory). 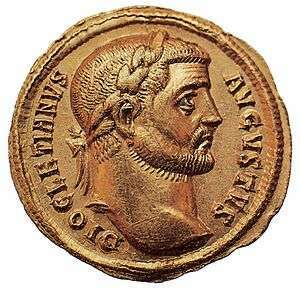 The first woman to receive the honorific Augusta was Livia Drusilla, by the last will of her husband Augustus. From his death (14 AD) she was known as Julia Augusta, until her own death in AD 29. A late Byzantine example of Augustus in imperial titelature: in this miniature from ca. 1404, Manuel II Palaiologos is titled "basileus and autokrator of the Romans", but also "aei augoustos" ("always augustus"), after the late antique formula "semper augustus". Under Tetrarchy, the empire was divided into Eastern and Western halves. Each was ruled by a senior emperor, with the rank of augustus, and a junior emperor, who ranked below him as a caesar. The Imperial titles of imperator, caesar, and augustus were respectively rendered in Greek as autokratōr, kaisar, and augoustos (or sebastos). The Greek titles were used in the Byzantine Empire until its extinction in 1453, although "sebastos" lost its imperial exclusivity and autokratōr became the exclusive title of the Byzantine Emperor. The last Roman Emperor to rule in the West, Romulus Augustus became known as Augustulus ("little Augustus"), due to the unimportance of his reign. The Latin title of the Holy Roman Emperor was usually "Imperator Augustus", which conveys the modern understanding of "emperor" as monarch of an empire. Augustus remains in use as a given name. ↑ Wells, John C. (1990). Longman pronunciation dictionary. Harlow, England: Longman. ISBN 0-582-05383-8. entry "Augustus"
↑ Hornum, Michael B., Nemesis, the Roman state and the games, Brill, 1993, p.37 footnote 23, citing epigraphic evidence from the Roman province of Cisalpine Gaul. ↑ It appears as such in works of Cicero, before its use by Octavian, later known as Augustus. See entry at Lewis and Short's Latin dictionary, online at perseus.org. ↑ Haverfield, F J, "The name Augustus", Journal of Roman Studies, 5 (1915), pp. 249‑250, available from penelope.uchicago.edu Octavian was also an augur. Haverfield surmises that the choice of "Augustus" as name might also have meant to overshadow the legend "AUG" on coins issued by his defeated enemy Pompey' – where "AUG" signifies Pompey's status as an augur, defeated with the help of Augustus' superior augury.